"TRAPER" Boilies. Discounts Apply ! 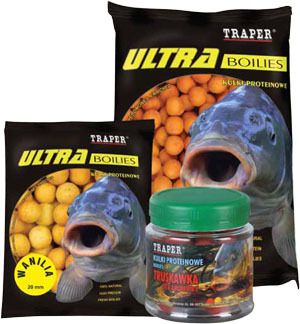 "TRAPER" Euro Boilies is the most popular carp bait used by anglers in Europe. It has proven excellent even in waters with a limited carp population. High quality ingredients containing highly concentrated protein are the basic in the series. Euro boilies are available in many flavours. Euro boilies have also proven very effective for big catfish..